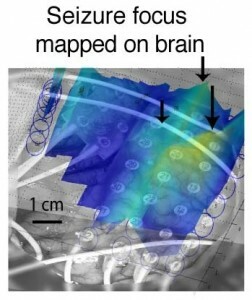 Localization of epileptic foci in the brain (poster presented at AES 2010, San Antonio, TX): The main objective of this study is to develop a computational method for improving the localization of epileptic seizure foci in the brain based on multi-channel ECoG/EEG recordings. Unlike other EEG source localization methods, such as LORETA, we were looking for a solution that specifically localizes epileptic activity relative to the background of normal EEG activity and does so at a higher than electrode grid resolution. From a surgical planning point of view, due to the dynamic nature of seizures, four types of information are critical: • The location of seizure initiation • The location of seizure maintenance • Seizure propagation • The difference between default state and seizure state. Below is a phase reconstructionof seizure propagation. 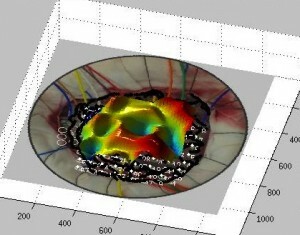 The hot colors indicate the seizure initiation zone and cold colors the seizure termination.